On a whim, I grabbed a sucker from the little bin at the Trader Joe’s checkout line last week. Maybe the cashier thought I had a little one waiting at home (or it’s for the pug?? ), but really I had no shame as I politely asked permission, as a childless grownup, to take one. That cherry sucker, or lollipop, for those of you confused by my vocabulary, was the best thing I’d tasted all week. I’m not sure HOW, save for artificial flavoring, they pack so much cherry flavor into a tiny piece of candy, but it left me with a craving for more, sans high fructose corn syrup. Coincidentally, that day happened to be one of many in a stretch of 90-something and humid ones, so, at the next grocery store, I planned to snag a box of whole fruit cherry popsicles. Except there weren’t any. Just weird, unappealing flavors like lime and mango. I was disappointed, but not deterred. It took no time at all for me to get home and unpack the groceries, hop on my laptop, and start searching for cherry popsicle recipes. As a bonus, I’d get to use my newly acquired popsicle mold! A few pages down the Google results, something interesting caught my eye: the reputable Carla Hall’s recipe for frozen cherry pops, with a sugar syrup base infused with all kinds of stomach soothing ingredients. Kind of like an herbal tea blasted, yes, blasted, full of cherry flavor. Fast forward past my mad scientist kitchen experimenting, and I’m slurping a super, well, cherry-ish, popsicle that absolutely hits the spot. You know, the one created by that cherry sucker. 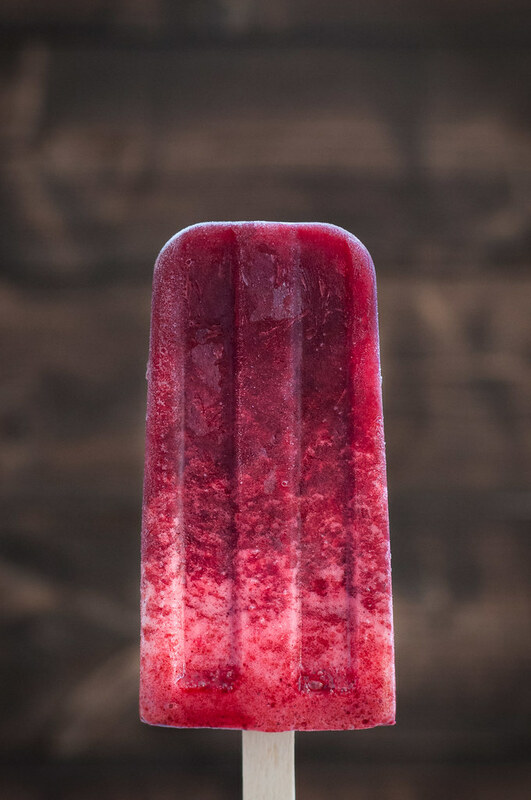 These frozen pops are colorful, and a little bit ombré thanks to the frothy cherry mixture, and they are the essence of sweet, freshly picked cherries in every way, even if the only cherries you can find for a reasonable price are in the freezer aisle. Honey-based syrup adds just a hint of natural sweetness, since, in my opinion, the already sweet cherries don’t need abrasively sweet white sugar, and neither do your teeth. 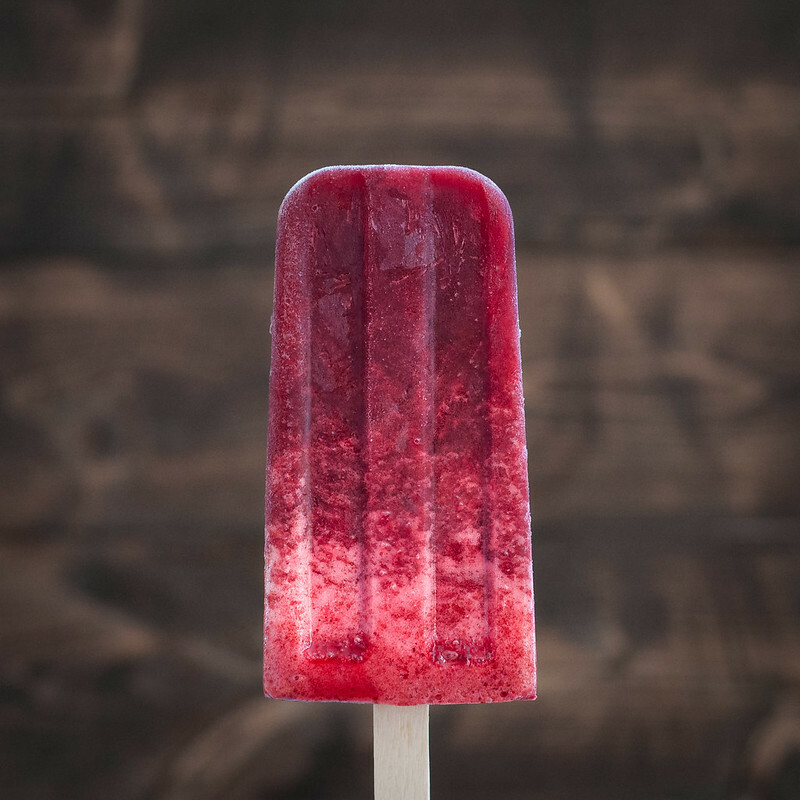 Notes of ginger, mint, and lemon are super subtle, but they balance the sweet cherries perfectly while creating a more complex flavor experience for that foodie popsicle eater. As if all that weren’t enough, the herbal ingredients also leave you feeling energized and happy in the belly afterwards, unlike more artificially sweetened treats would do. Of course, in the time it took me to finish the recipe and finally write this post, the weather has cooled down a bit, but the forecast tells me that it’s just a tease, and we’re destined for a few more scorchers. If you’re in the same predicament, hopefully you can add these colorful frozen pops to your dessert arsenal until we kick off fall cooking season with all the squash and comfort food! 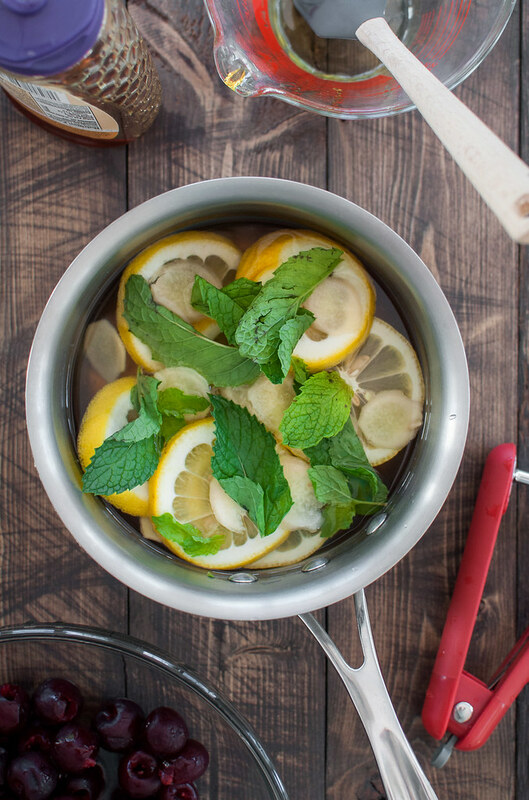 In a saucepan, bring water, honey, lemon, ginger, and mint to a boil over medium high heat. Reduce heat to a gentle simmer for 10 minutes, stirring occasionally. 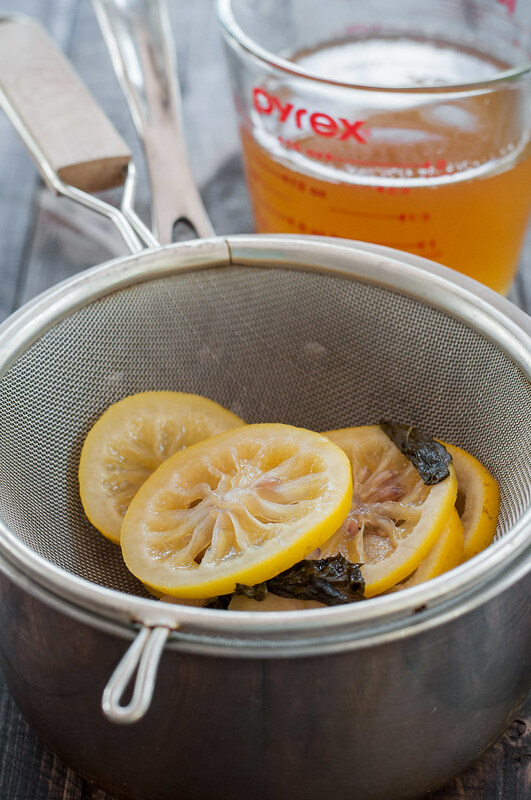 Pour through a colander or fine mesh strainer into a bowl or liquid measuring cup, and chill the liquid for half an hour. 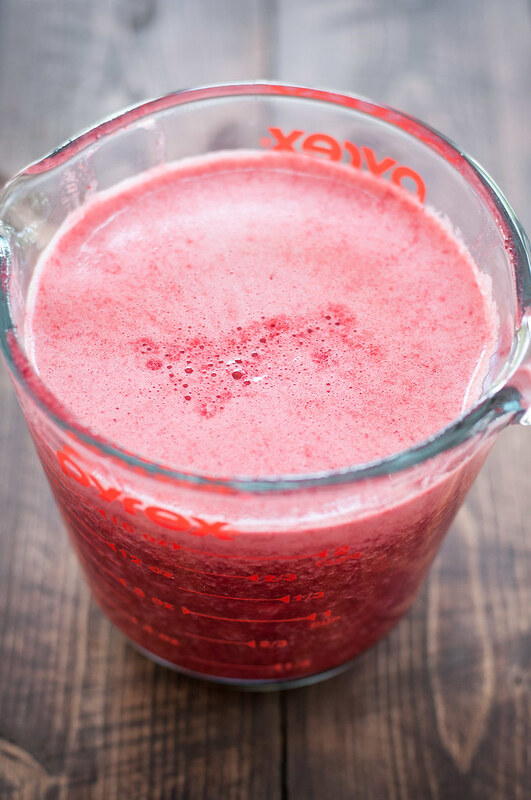 Combine infused liquid and cherries in a blender and blend until as smooth as you can get it. If desired, strain through a fine mesh strainer to remove the small bits of cherry skin. Pour blended mixture into popsicle molds and freeze (without sticks) for about 45 minutes. There will probably be a little extra liquid, which is delicious over ice, or you can refrigerate and save it for more pops. Insert sticks (they shouldn't pop out or tip over; if they do, wait another 20 minutes) then freeze until solid: at least several hours, preferably overnight. For easier removal, run hot water over outside of molds until loosened. Note: This page contains affiliate links. It does NOT contain sponsored content. Affiliate links (to products I recommend, on Amazon) offset my ingredient and website maintenance costs, so I can keep bringing you icy recipes like this one. Thanks!